Sometimes, you just need to have a little patience, and it pays off. I had spent the day in Dove Dale – recommended for a day out any time of year (just be aware in winter that the sunlight does not reach the bottom of the gorge, so dress warmly). I took some images of the stepping stones by Thorpe Cloud before dawn – they were ok, but not outstanding. I walked down the gorge taking images, and walked up Thorpe Cloud (a stiff pull to the top) then headed back to the stepping stones after sunset. As I was taking some long exposure images, two things happened. 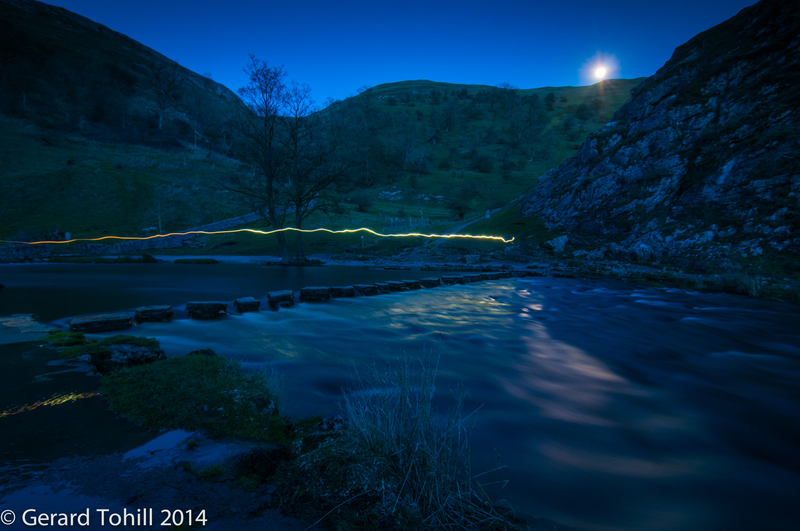 First of all the moon rose above the ridge, bathing the water in a cool light, and then someone headed across the stepping stones using a head torch – giving this wonderful light trail. Photography stuff: 12-24mm lens at 12mm, 30 seconds at f/9.0, tripod, 3 stop graduated ND filter to hold back the light from the moon. Patience deserves rewards. Very nice image. Fabulous photo!! Thank you for adding the settings to your images. As an amateur photographer, I find these very helpful. You are very welcome. I hope the information proves of use. I love your work so please take this as a compliment. I think the version of the photo you have in the post is too small. Too few people are clicking on it to see the full version. I would recommend only posting one 800 pixel wide shot…too small for anyone to bother stealing and breaking your copyright in any meaningful way, but large enough for people to see the wonderful detail and sharpness of your photos. Honestly, I LOVE your work.